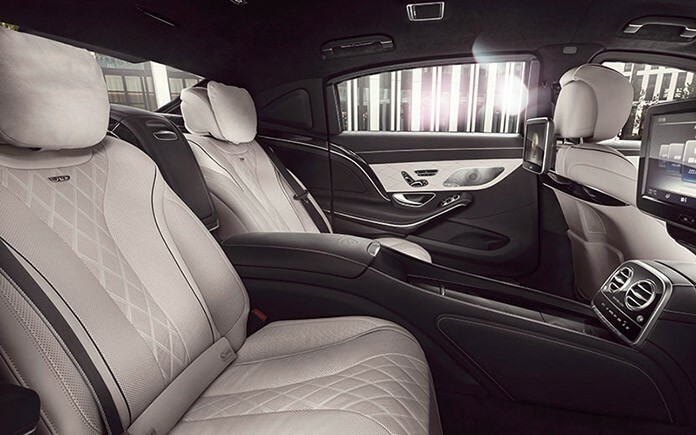 The special-protection version of the Mercedes-Maybach is the first vehicle to be certified with the highest ballistic protection level VR10 for civilian vehicles. These guidelines specify that the bodywork and windows must be able to withstand hardened steel core bullets fired from an assault rifle. 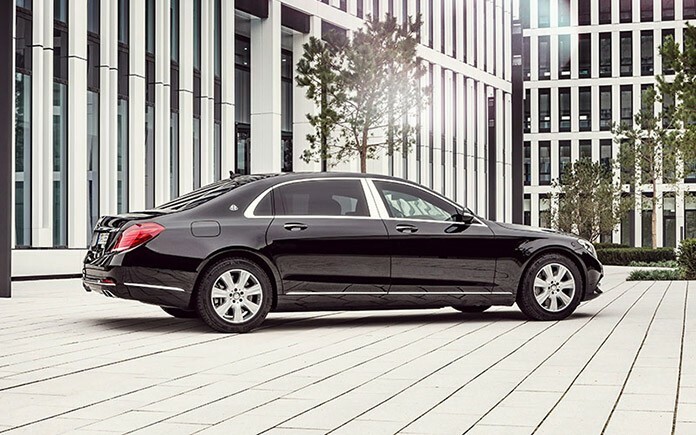 When it comes to blast protection in accordance with Directive ERV 2010, too, the Mercedes-Maybach S 600 Guard leads the luxury class. With the new record the Mercedes-Maybach emphasises its exclusive position as a Mercedes-Benz flagship in terms of occupant protection, too. The price of the Mercedes-Maybach S 600 Guard is €470,000 plus VAT. 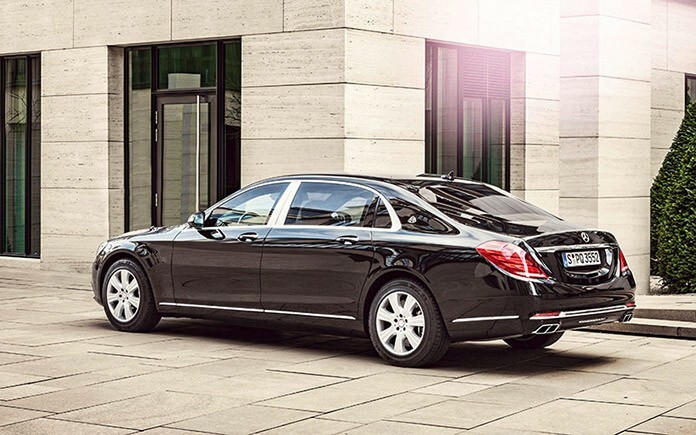 The Mercedes-Maybach S-Class fuses the perfection of the Mercedes-Benz S-Class with the exclusivity of Maybach. At 5453 mm long and with a wheelbase of 3365 mm, the flagship of the Mercedes-Benz model range is 20 cm larger in both dimensions than the S-Class Saloon with long wheelbase. Rear passengers benefit from this increased size, as well as from standard equipment that includes executive seats on both left and right and other exclusive details such as innovative voice amplification. 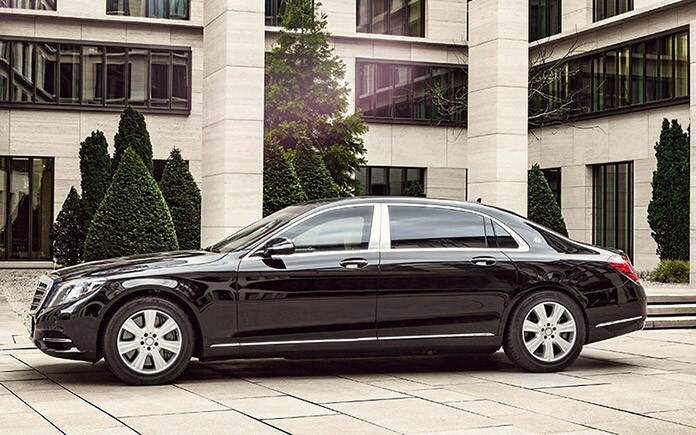 Heads of state and business leaders en route have never been as comfortable and simultaneously as well protected as they are in the new Mercedes-Maybach S 600 Guard. The armoured version of the Mercedes flagship delivers the highest levels of ballistic and blast protection available for non-military vehicles, at the same time offering unsurpassed standards of spaciousness, ride comfort and luxury on-board features. The rear seats have been repositioned further back, adding to the sense of privacy. Part of the protection concept is that it takes a very keen eye to distinguish the armoured version of the Maybach from its series-produced counterpart. A series of special technical features also ensures that the Maybach S-Class remains mobile during and after an attack and is therefore able to exit the danger zone. The new Mercedes-Maybach S 600 Guard has been officially certified by the Ballistics Authority in Ulm; for the first time it meets the requirements for VR10 protection rating according to Directive BRV 2009 Version 2 (Bullet Resistant Vehicles). These guidelines specify that the bodywork and windows must be able to withstand hardened steel core bullets fired from an assault rifle. The vehicle also has an ERV 2010 rating (Explosive Resistant Vehicles). The test criteria used to determine this rating are not in the public domain. After inspection by Germany’s Federal Office of Criminal Investigation, the vehicle was approved without any constraints. Outstanding strength and stability thanks to specific reinforcement of the base structure which is integrated into the bodyshell production stage. The high level of comfort is maintained by sophisticated integration and intelligent overlapping of all protective elements. Already at the bodyshell stage, protective components of special steel are integrated into the cavities between the body structure and the outer skin. Special aramid and PE components help ensure the protection offered by the vehicle. Intelligent overlapping systems at particularly critical points, such as material transitions and interstices, provide comprehensive ballistic protection. The windows are a fixed and essential part of the protective elements and particular attention was paid to selecting the appropriate materials and thicknesses. The windows are coated with polycarbonate on the inside for splinter protection, and have outstanding visual characteristics, despite their laminated structure. The interaction between all the components provides the occupants with a highly effective protective space which not only includes ballistic protection, but also comprehensive protection against explosive devices. In the event of an explosive charge detonating at the side of the vehicle, the armouring protects the occupants as effectively as it does in an assault with explosives beneath the vehicle: the new underbody armouring, already tried and tested in the S-Class, entirely covers the underbody under the occupant compartment, a unique feature in the civilian special-protection segment. In addition to the new Mercedes-Maybach S 600, the Mercedes-Benz Guard range currently includes S-Class, G-Class and GLE models. With special-protection vehicles in six model series, Mercedes-Benz offers a more extensive range of special-protection vehicles than any other manufacturer. As in the case of series-produced models, the full manufacturer’s warranty also applies to the models in the Guard family. All the Mercedes-Benz service outlets worldwide are also able to service, maintain or carry out any necessary repairs to the Guard models. Mercedes-Benz G 500 Guard: The G 500 Guard is equipped with a 5.5-litre V8 engine and highest protection to VR7 (according to BRV 2009). Mercedes-Benz GLE Guard: Available as GLE 350 d 4MATIC and as GLE 500 4MATIC. As a special-protection vehicle, the GLE Guard meets all requirements of protection levels VR4 or VR6 (according to BRV 2009) and ERV 2010. Mercedes-Benz S-Class Guard: Available as an eight-cylinder (long-wheelbase S 500) and as a twelve-cylinder (long-wheelbase S 600). The special-protection version of the new S-Class, presented in 2014, was the first vehicle to be fully certified with the highest ballistic protection level VR9 (according to BRV 2009, version 2). 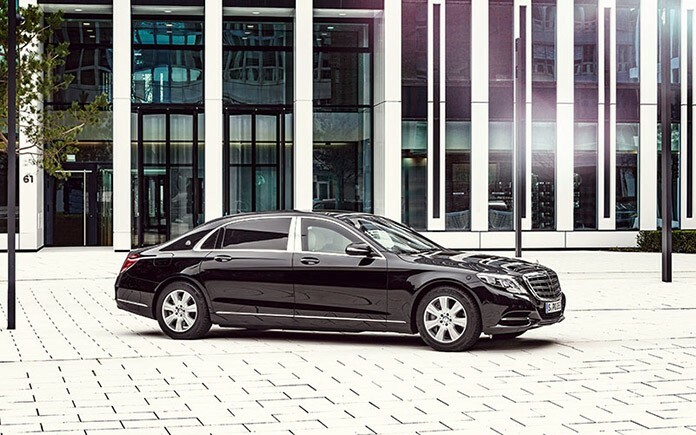 When it comes to protection against explosives, the S-Class proved its capability by fulfilling the requirements of ERV 2010 (roof, floor, sides) and Germany’s Federal Office of Criminal Investigation. It started way back with the 1928 Nürburg 460 model, when Daimler-Benz became the first company to begin factory-fitting saloons with special protective features to shield the occupants from gunshots and explosives. Mercedes-Benz also developed specially protected variants of subsequent luxury-class and prestige vehicles such as the “Grand Mercedes” 770 and the 500 model. Emperor Hirohito of Japan personally selected an armoured “Grand Mercedes” as his official car. Today the vehicle, delivered in 1935, can be seen in the Mercedes-Benz Museum in Untertürkheim. Many politicians and heads of state followed the emperor’s example and entrusted their safety and security to Mercedes-Benz special-protection vehicles. From 1965 onwards Mercedes-Benz offered numerous models with special protection. In addition to the legendary Mercedes-Benz 600 Saloon and Pullman Saloon models, in the 1970s and 1980s the range included the 280 SEL 3.5 and V8 S-Class models, the 350 SE/SEL and 450 SE/SEL as well as the 380 SE/SEL to 560 SEL. Since 1979 Mercedes-Benz has also been building G-Class models with protective systems.